The Estonian War of Independence was a small part of the much larger Russian Civil War. When the Russian Empire collapsed into civil war the Estonians and many others made a bid for independence in 1918. First they were invaded by the Germans, but when they surrendered to the allies they evacuated Estonia. Shortly afterward it was instead the Red that invading the country. They quickly took Narva and advanced quickly toward Tallinn. At Christmas Eve they are just 34 km from the capitol. At this point the first of two Finns regiment arrived in Estonia to help their neighbors. Many, if not all, of the Finns were veterans from the Finnish Civil War. Estonians and Finns are closely related and their language is very similar. With help from armoured trains the Estonians counter-attack and push back the Reds to Narva. A force of 1000 Estonian marines and Finnish volunteers made a surprise attack on Narva and pushed out the Reds. At the end of January Estonia was liberated and instead they attacked into Russia and Latvia. But the Germans hadn't disappeared from the Baltics; there was a large army in Latvia fighting the Reds. Now they invaded again Estonia to create a Baltic state under German influence. To make a long story short a year later the Estonians had defeated both the Russians and the Germans and now they were independent! 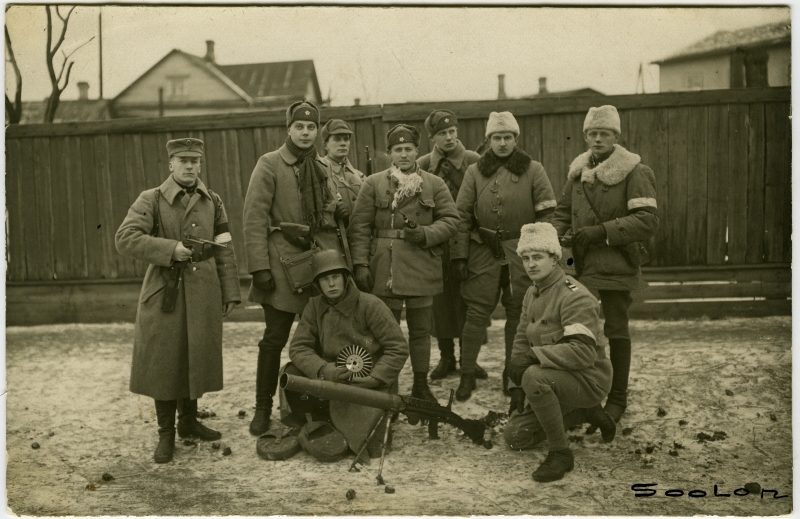 The Estonian army had during spring 1919 volunteers from Finland, Sweden and Denmark. There were as many as 300 Swedes in the Estonian army. Most were in Finnish or Estonian units, but they did also have a unit of their own, Svenska Kåren i Estland (The Swedish Corps in Estonia). There were around 100 men in it. Many had fought in the Finnish Civil War, but instead of being an elite unit it was a disaster. While the soldiers and officers were in Narva, the staff was in Tallinn, drinking. It looks like they used all the corps money for booze. A few months later the unit had a new commander and it took part in battles in southern Estonia or northern Latvia. Very soon half of the men were wounded. Instead of recruiting more Swedes to replace the losses the unit was disbanded. It is possible that low moral made it unusable for battle. It is even possible that there was a mutiny just before the end. After the disbandment a few joined Finnish, Danish or Estonian units, while others formed "Svenska Vita Legionen" (The Swedish White Legion) and fought for the Russian North-western army. But did they use Swedish uniforms? In the Osprey book Man-at-arms 305 there is a picture with Swedish volunteers. They don't have Swedish uniforms, but they have helmets that look like the early Swedish. 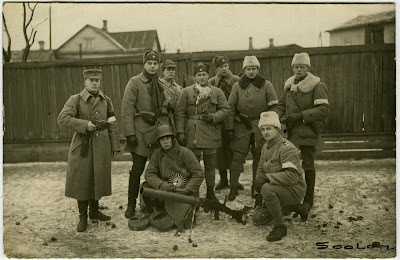 The caption says that it is from 1918 and the helmets are Swedish. The problem is that all my sources say that the helmet was being used from 1921 by the Swedish army, so the text must be incorrect, either it is later or it is some other helmets. Very good write-up Björn !